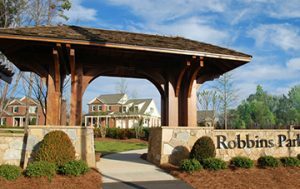 Robbins Park is located in Cornelius, in the midst of the most exciting and active part of Lake Norman, you’ll find home. Discover why so many love living in the Park. Nature trails wander through a beautifully wooded preserve and connect with the paved McDowell Creek Greenway. Recreation abounds from an imaginative playground, play fields, and tennis courts to disc golf and more. Neighbors enjoy a private community pool and for more water activities, a Lake Norman marina and boat club are across the street. Robbins Park is adjacent to the area’s favorite destination: Birkdale Village — making it an easy walk or bike ride to take in a movie, enjoy a meal and shop at Williams-Sonoma. Living is easy. Everything is convenient from shopping, restaurants, entertainment, golf, recreation and more. Schools are close by, as is Interstate 77 for a drive to Uptown Charlotte.